OAKLAND, Calif. – Stephen Curry pulled Zaza Pachulia aside and made one thing clear to the Warriors big man: We got your back. Other teammates echoed that message. 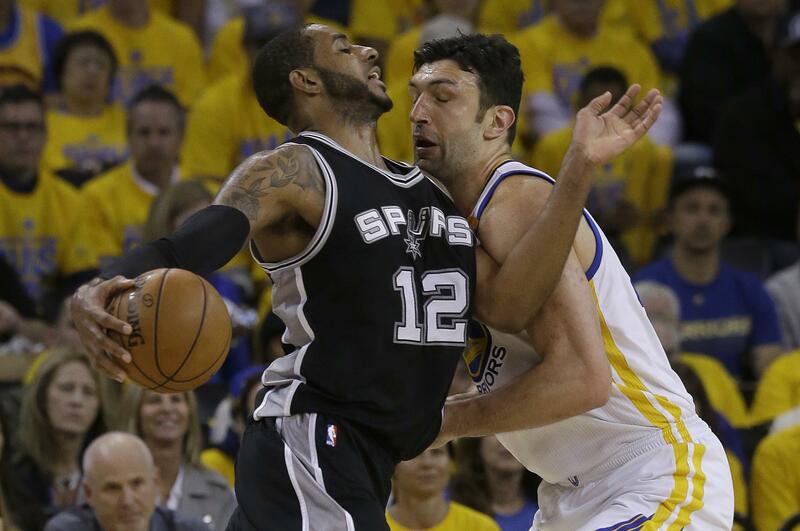 Pachulia will most certainly receive a villain’s welcome for Game 3 of the Western Conference finals Saturday at AT&T Center regardless of whether he’s on the court or not, simply because he was involved in the play that injured Kawhi Leonard in the series opener. Leonard, whose status for Game 3 remained unclear Friday, didn’t play in Game 2 after re-injuring his tender left ankle in the third quarter of Game 1 when he came down on Pachulia’s foot after shooting a long jumper. San Antonio lost 113-111 without him, squandering a 20-point halftime lead, and Spurs coach Gregg Popovich was peeved. The next day, Popovich called the play “dangerous” and “unsportsmanlike” and insisted Pachulia has a history of such. The Warriors sure expect it. Leonard and Pachulia were listed as questionable Friday, along with key Warriors reserve Andre Iguodala. Popovich said Leonard had only shot the past couple of days. Pachulia bruised his right heel and missed the second half Tuesday, while Iguodala sat out Game 2 and all but 10 minutes of the opener with soreness in his left knee. Leonard said his ankle is “still not ready,” but he didn’t rule out that it could be much improved by game day. He said he won’t play if he can’t be his usual strong self and use both legs to take quality shots and not force things by being off-balance. Asked again whether he thought Pachulia’s play was dirty – initially having said he didn’t consider it intentional – Leonard said he’s spending his energy on getting healthy. “I’m not worried about that,” he said. Warriors coach Steve Kerr’s health has improved enough that he traveled to Texas with the team, an encouraging sign after he returned to practice for the first time in more than three weeks last Saturday following a May 5 procedure to repair a spinal fluid leak. The reigning coach of the year then attended Games 1 and 2 behind the scenes but spoke to the Warriors before the game and at halftime. While Golden State hopes to get Klay Thompson going on offense, rebounding is a focus again after the Warriors surrendered another 22 offensive rebounds to the Spurs in Game 2. Thompson is 6 for 21 over the first two games. Curry knows the shooting will come. AP freelancer Raul Dominguez contributed from San Antonio. Published: May 19, 2017, 4:23 p.m.